Cabine Waterfront pronto para fuga da sua família. Localizado na extremidade da angra de Isle em Monkey Island apenas um carrinho de golfe passeio de distância do campo de golfe de Shangri-la e casa do clube. cabine espaçosa com 2 quartos e 2 banheiros. camas suficientes para 8. Sala de estar é grande o suficiente para acomodar o seu colchão inflável. Grande mesa de jantar e mesa de cozinha vai acomodar todos os seus convidados para o jantar, ou jogar um bife na grelha e relaxar na área de pátio coberto apenas algumas jardas do lago. Amarrar o seu barco, pescar ou nadar a partir do cais situado em frente ao cabiin (lado oeste da doca está previsto para este cabine. lado leste pode ser ocupado por outra parte). The house was great. It gives you the lake house feel. The back patio is perfect for hanging out. The dock is perfect if you want to swim. We tied our boat up all weekend there. Easy to get on and off the boat. The dock is far enough back in the cove the waves do not affect the dock. I will be renting this place again in the future. Owner was very helpful. Place was very clean and relaxing. If I go back to Grand it will probably be it if you have a boat parking is very small for vehicles with trailers. Happy the house worked out for your stay. We do have parking for several cars & trailers right beside the house. There are even plug-in areas to charge an additional boat. Its only 50-100ft from the house. I'm sorry, we must not have made that clear. Hope you come back again this fall or next summer. The property was very, very clean. Scott and Melissa were great to work with. The Dock is brand new and very easy to access. The house easily fit our family of 7 with all of the comforts of home. Could not ask for more. We will be back! Thank you! Great property on the water! This was an awesome property for our group on 4th of July. Right on the water, brand new deck, huge living room and plenty of sleeping space. The outside patio was a great hangout every night to relax and grill food. This was my second time renting this location and I would come back for a 3rd without hesitation. The owners were great and helped us with all of our questions along the way. Highly recommend! Loved this place. Great house stocked with everything you may need. 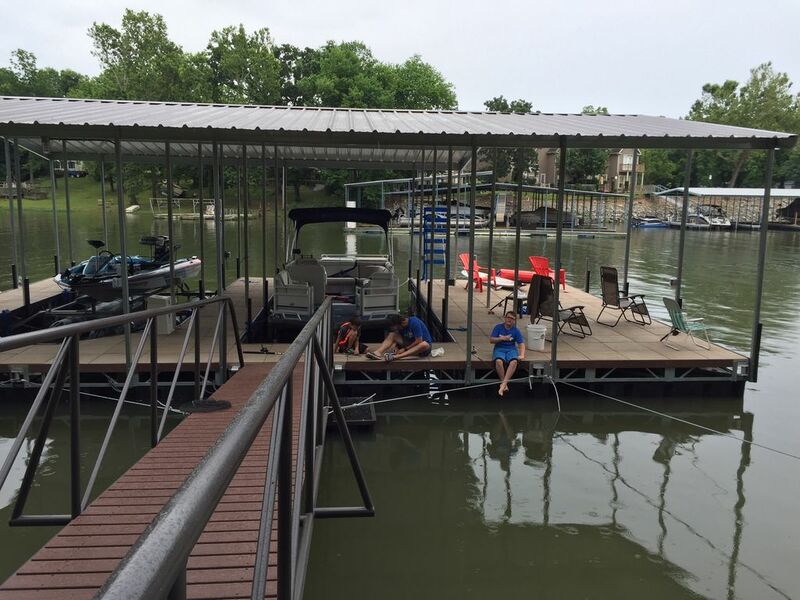 Great covered patio seating area, outdoor fire pit, and a great dock. Great little place! Easy to get to. Cute house. Loved the new dock. And the deck was great to sit and enjoy coffee every morning. Will be back. Thanks. Grande cabine para você Grande lago fuga. Localizado na extremidade da angra de Isle em Monkey Island. Bela Shangri-la campo de golfe e club house são apenas um carrinho de golfe passeio de distância. Conduzir o seu barco até a foz do nosso cove (400 jardas) para jantar no restaurante 'The Landing' ou visitar vários restaurantes locais e clubes nocturnos a menos de uma milha de distância. Amarre o seu barco para a nossa doca e peixe ou nadar durante todo o dia. Dois quartos / dois cabine de banho é espaçoso o suficiente para um grupo. Dormir às 8 muito confortavelmente. Mestre quarto tem duas camas queen size com chuveiro / banheira combinados. Segundo quarto tem uma cama com beliches duplos. Casa de banho adicional tem um vaso sanitário e chuveiro. Comer na cozinha, fezes de contador e grande mesa de jantar terá lugar todos os hóspedes. Tabela disponível para refeições ao ar livre. Parque de estacionamento disponível a poucos passos de distância da porta da frente. 'O Aquabar' localizado na marina de pouso está localizado na foz do nosso enseada. Puxe em seu barco para abastecimento de serviço completo, suprimentos e um agradável jantar e bebidas no lago. O novo campo de Golf Shangri-la e clubhouse restaurante espetacular é apenas um carrinho de golfe passeio de distância.